This product has a unique and exclusive 2 in 1 design – the smart LED bulb with bluetooth and speaker. The E27 socket enjoys easy installation and good compatibility to all bulbs, can support a wide range of bluetooth and wireless audio configuration files and be compatible with the devices that have bluetooth function. 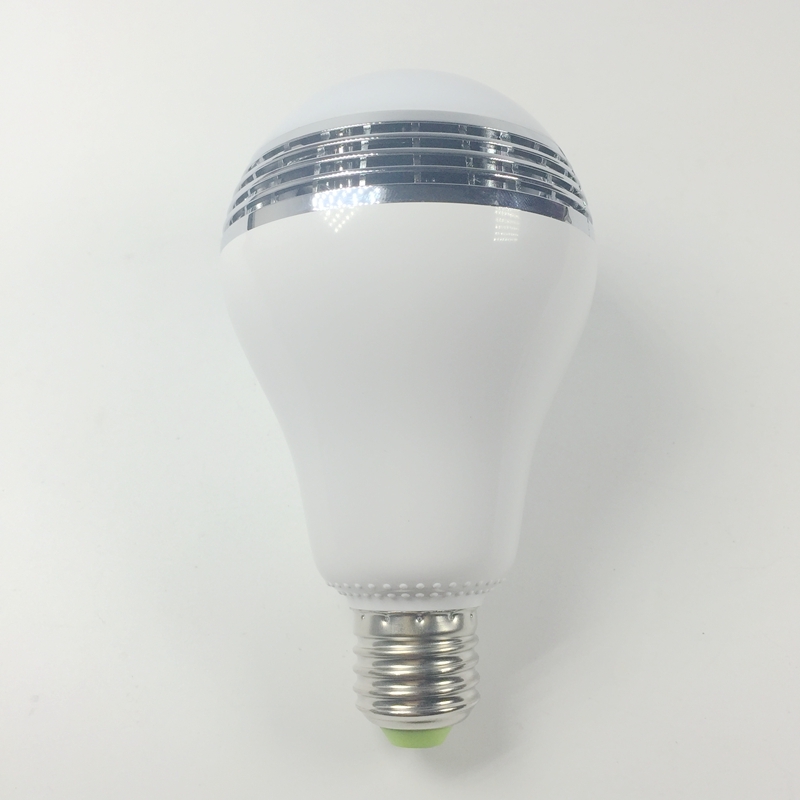 More importantly is this bluetooth LED bulb using low consumption 4.0 technology. Wish you can have infinite joy from the combination of light and music. 1) We accept West Union, TT. All major credit cards are accepted through secure payment processor ESCROW. We ship by Registered Airmail, DHL,UPS, FEDEX or EMS. We will select the fast and reliable way for delivery. Save on shipping	and safter on delivery. Orders processed timely after the payment verification. We are not responsible for wrong or undeliverable address. Delivery time: By airmail: 2-3 weeks to ASIA, West EURO, and North America. 3-5 weeks to South America, Mid-East, East EURO and Africa. By EMS: 5-20 businessdays, By UPS, DHL, FEDEX: 3-7 business days	SERVICE TRANSIT TIME is provided by the carrier and excludes weekends and holidays. Transit times may vary, particularly during the holiday season. International Buyer please note:	1 We are not responsible for any custom duty or import tax.These charges are not included in the item price and shippingcost. 2 Please Check with your country`s customs office to determine what these additional costs will be prior to bidding/ buying. 1. You have 7 days to contact us and 15 days to return it from the date it was received. If this item is in your possession more	than 7 days, it is considered used and WE WILL NOT ISSUE YOU A REFUND OR REPLACEMENT. There are NO EXCEPTIONS! The returning shipping cost will be your expenses. 2. All returned items MUST BE in the original packaging and you MUST PROVIDE us with the shipping tracking number, specific	reason for the return, and your po#. 3. We will refund YOUR FULL WINNING BID AMOUNT, upon receipt of the item in its original condition and packaging with all components and accessories included, AFTER BOTH Buyer and Seller cancel the transaction from aliexpress. OR, you may choose	to have a replacement. 1. 12 months Manufacturer`s limited Warranty for defective items (excluding items damaged and/or misused after receipt). Accessories come with a 3-month warranty. 2. Defective items MUST BE reported and returned within the warranty period (and in the original packaging, if possible). You must tell us what the defect is and give us your order number. WE DO NOT REPAIR OR REPLACE ITEMS WITH AN EXPIRED WARRANTY.You agree to all of the above-listed policies upon ordering on aliexpress! Due to high volume in feedback, our system is designed to leave positive feedback for you once we have received positive feedback. We care about our valued customers, and will always try to help you. Please give us the opportunity to resolve any problem. We understand the concerns and frustrations you might have, and will try our	best to resolve the issues	Please email us before leaving any negative feedback or opening any dispute on the site. We will help you to resolve the problem. We appreceate your positive feedback .